The Whippet was designed by Sir William Tritton of Foster & Co. as a pursuit tank to exploit breakthroughs made by the heavy Mk. IV tanks. The fighing compartment for the crew of 3 or 4 was at the rear with twin engines in front. The armoured fuel tank projected forward between the front horns. A seperate engine drove each set of tracks through its own gearbox and transmission. Steering was effected by accelerating one and retarding the other at the same time. 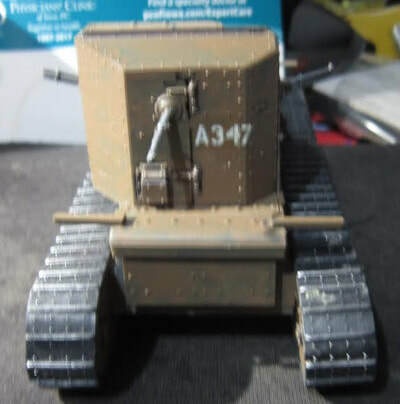 Armament was 3 or 4 Hotchkiss 0.30 in/7.7mm machine guns. Armour was riveted steel plates 0.24 or 0.55 inch thick (5-14 mm). Combat weight was 14 tons. It had twin Tylor 45 hp petrol engines as used on London buses of the day. Top speed was 8.3 mph (13.14 km/h). Range was (on roads) 80 miles (129 km). Fuel capacity was 70 imp gallons (318 litres). Length was 20 ft (6.1 m). Width 8.58 ft (2.62 m). Height 9 ft (2.7 m). Production commenced in October 1917. It was first used in battle on March 26th, 1918 during the great German offensive. 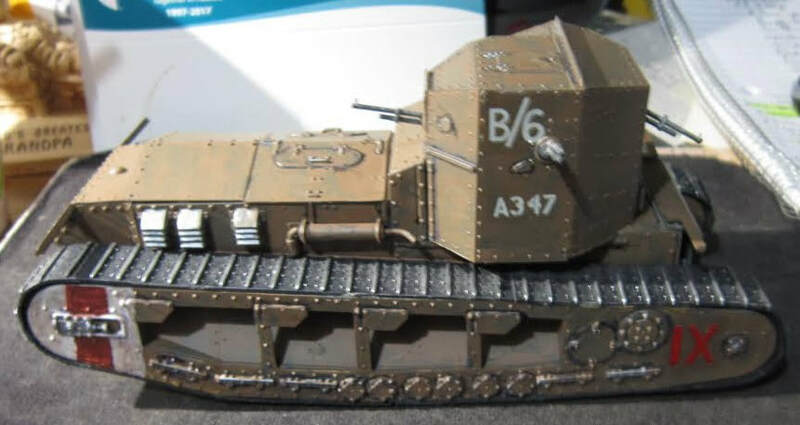 They are most remembered for their role in the Battle of Amiens on August 8th, 1918, when 96 Whippets of the 3rd Tank Brigade were assigned to the cavalry corps. On November 5th, 1918 eight Whippets of the 6th Battalion took part in the last tank action of the war. 200 were made. Captured ones were used by the Germans (Beute Panzerwagen A). The Whippet became the first Japanese tank when several surplus Whippets were sold to Japan in 1922. These served until at least 1930. Emhar was a model company under Pocketbond Ltd. located in the UK. It has gone out of business I believe. 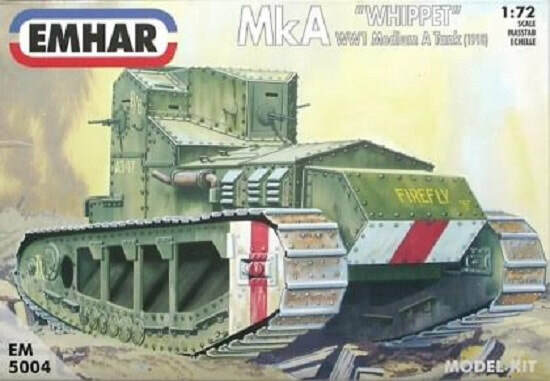 The box art shows a Whippet moving across no-man's-land. It is overall faded green, with a yellow word FIREFLY on the nose over a horizontal white, red, white bar. These bars are again painted on the sides of the track guides at the front. A white roman numeral IX is on the rear end of the sides of the track guides. High on the sides is the white number B/6 above a white A347. 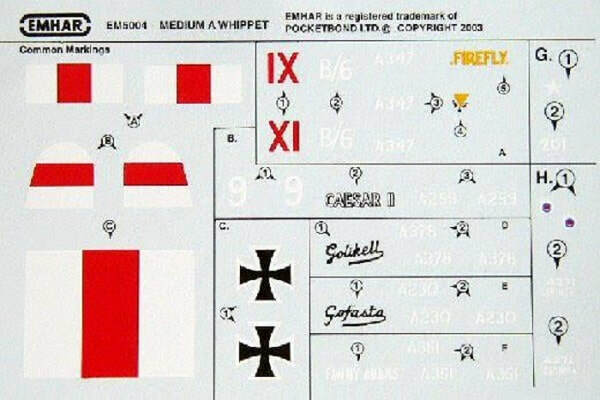 One side panel has a small color profile of a Whippet in captured German marks. It is overall green with a large German cross on the sides of the hull. This is followed by the history of the Whippet. The other side panel says the kit is for modelers over 8 and paint and cement are not included in multiple languages, including English. This is followed by a small color repeat of the box art. 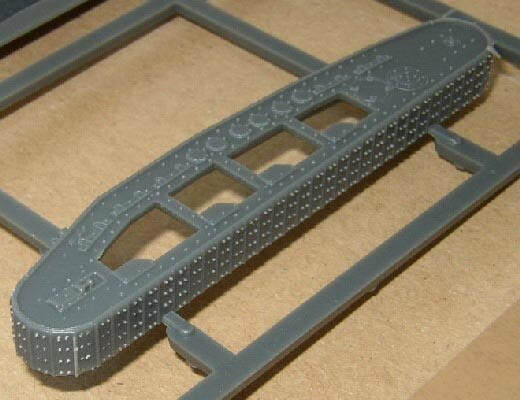 This kit contains 2 light grey trees of parts and 4 black vinyl tread lengths, . They are not illustrated in the instructions. However, they are alphabetized and have part number tabs next to the parts on them. Trees are not cello bagged. The decal sheet and instructions complete the kits contents. The instructions consist of a single sheet folded in the center to create 4 pages in 8 1/4" x 11 3/4" page format. Page 1 of the instructions has the history of the Whippet on it in German, French, English and Italian. Page 2 and 3 give a grand total of 9 assembly steps. Page 4 has three 4-views and a 2-view for painting and marking the model. The second 4-view is one in overall green with a white number 9 high on the raised fighting compartment sides over a white number A255. It has the nose of the side tread supports painted with white, red, white vertical stripes. This is again repeated on the nose of the tank. The 2-view os of a German captured Whippet. It is in a base of tan with green swatches. It has a large Germn cross on the sides of the hull. Colors suggested to use are called out in FS numbers at the bottom of the page. I don't have a picture of the letter A tree to provide here anymore. It did hold the 4 machine guns I remember though. ​There are no clear parts of crew figures included in the kit. The decal sheet completes the kits contents. ​I put this kit together very quickly. It is definitely a weekend project and well within the skills of the average armor modeler. I painted mine Tamiya acrylic red brown. Panel edge lines were done with a Bic brand black jell ink pen. I highlighted the cleats in the tracks with silver Rub-N-Buff out of its tube and on a finger. The air intake louvers for the engine were painted Testors steel. 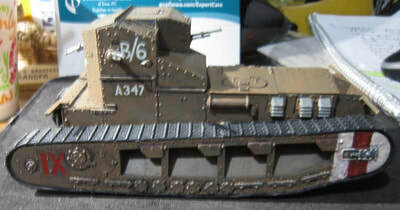 The decals were applied using both Walthers Solvaset and Model Master decal set. 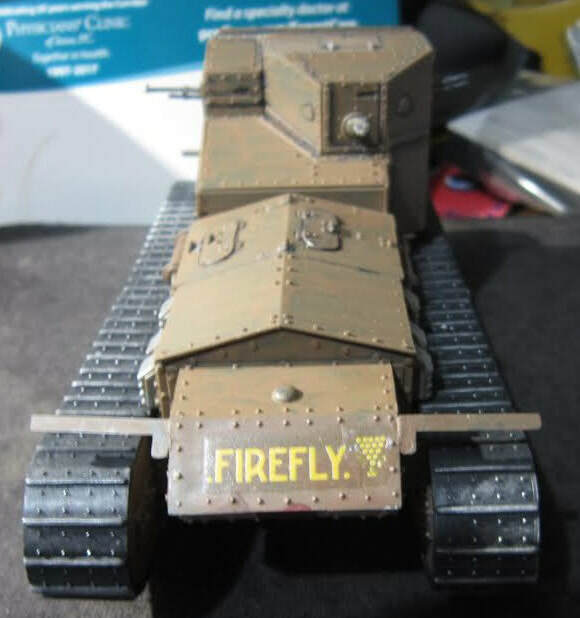 I did my tank in brown, rather than a green, because it said on a history of the tank I found on the web that the Whippet was described by veterans as being either green or brown. These vets were undecided about it. 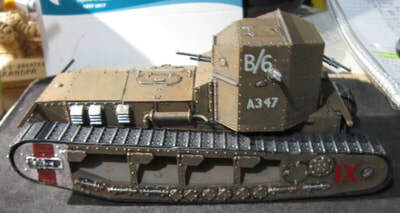 This is very nicely detailed tank externally. It was a joy to build. I bought my kit years ago at my local hobby shop.